Dr. Jonathan Chase is a wealthy, young, and handsome man with the brightest of futures with a very dark past. From Africa’s deepest recesses, to the rarest peaks of Tibet, heir to his father’s legacy, and the world’s darkest mysteries is Jonathan Chase, master of the secrets that divide man from animal, animal from man, Manimal. From Africa’s deepest recesses, to the rarefied peaks of Tibet, heir to his father’s legacy and the world’s darkest mysteries. 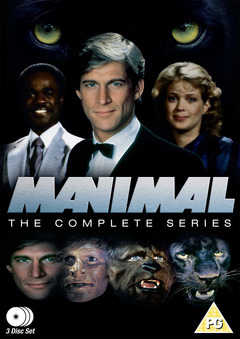 Jonathan Chase (Simon MacCorkindale) famed Professor of Criminology, with the inherited powers to transform himself into any animal he wishes, uses that power to assist the new York Police Department in solving major crimes. He is assisted by Brooke Mckenzie (Melody Anderson), an intelligent and beautiful detective with the NYPD and Tyrone ‘TY’ Earl (Michael D Roberts) a former intelligence office with whom he served in Vietnam.